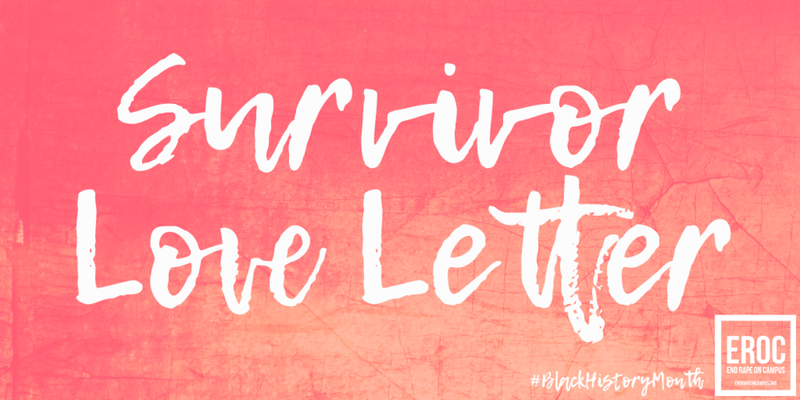 This is my #SurvivorLoveLetter to you this Valentine's Day. However, I also want to dedicate this love letter to the countless other Black women and girls who have been subjected to sexual violence. For the Black survivors struggling to stay in school after an assault, for the ones who can't find culturally competent resources in their community, for those whose perpetrators will never be held accountable because of your identity as a Black girl — and potentially other intersecting oppressions —for those who need support, concern, and care, but are met with hostility, disregard, and hate. You are loved. Although you may often feel isolated and afraid, especially with the current political state, please know that we are here and we're not going anywhere. We believe you and you are not alone. Black activism and social justice movements have always centered around love and affirming Black people's right to justice, life, and freedom. The Combahee River Collective expressed in its statement the inherent value of Black women and the necessity of Black women's liberation as observance of our right as autonomous humans. The Collective further stated that "love for ourselves, our sisters, and our community" is what drove its politics and motivation. Similarly, in my #SurvivorLoveLetter, I would like to express my love to my people, my culture, and especially my sisters. It is the love that I have for Black people that drives me to continue our struggle and work towards dismantling systems of oppression. Black History Month is the most exciting time for me because every year I am reminded of our greatness, magic, and resilience in the face of injustice. We stand on the shoulders of our ancestors as we celebrate their economic, social, and political achievements against all odds. Our ancestors, within the entire diaspora, have made the impossible possible. Let me say that again: Our ancestors, within the entire diaspora, have made the impossible possible — and I intend to follow in their footsteps. Many thanks and much love to all the womanists, Black feminists, and just regular Black women who came before me and gave me the language and knowledge to articulate and affirm my experiences. This Valentine’s Day, I commemorate Harriet Tubman, Assata Shakur, Sandra Bland, Kimberlé Crenshaw, Sojourner Truth, Aiyana Jones, and all my unknown and unnamed Black sisters and survivors; regardless of whether you’re gender non-conforming, trans, poor, queer, or undocumented, I love you, you are supported, and your life matters.